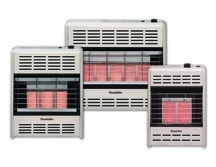 These ductless mini split systems are ideal for cooling and heating your desired area. A wall air conditioner is installed near the ceiling to help heat or cool any area of your home or business. The air conditioner is the ideal system to quietly cool your home or addition, while Heat Pump system's create both air conditioning and heat. FREE 25' Refrigerant Line Set with AmericAire Purchase Below! This ductless mini split air conditioner comes in cool only or heat pump configurations. 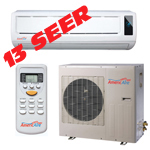 13 SEER efficiency has been a 30% increase in energy savings over the previous standards. 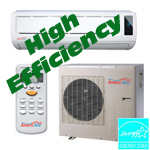 The ductless air conditioner is very quiet and is a perfect solution to cool any area of your home or business. UL certified. These wall mounted mini split systems have taken the time tested style of their predecessor and added an extreme efficient inverter compressor. Inverter compressors help these Energy Star Certified mini split air conditioners efficiencies reach 21 SEER. 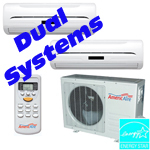 The combination of two indoor air conditioners with one inverter driven outdoor unit makes these dual mini split air conditioners a best seller. Our inexpensive multi split air conditioners helps save you money on installation and utility bills. 12,000 BTU Heat Pump, 17.5 Seer 230 volt split system. 12,000 BTU Heat Pump Mini Split system. 17.5 Seer, 230 volts. Parts warranty 1 year compressor and 2 years on parts. 18,000 BTU Mini Split system. 17.7 Seer, 230 volt. Parts warranty 1 year compressor and 2 years parts. 24,000 BTU Heat Pump. 16 Seer 230 volt split system. 24,000 BTU Mini Split system. 16 Seer, 230 volts. Parts warranty 1 year compressor and 2 years parts. 9,000 BTU mini split system. 17 Seer, 230 volts. Parts warranty 1 year compressor and 2 years parts.